The author served in the Intelligence Bureau [IB] for 37 years and has narrated events based on his experience on issues ranging from terror and corruption to relations with neighbouring countries. India does not follow the practice of declassifying the records after a certain period. The public and the students of history are deprived of an important source of information. A few memoirs that appear in the market are often a justification for the actions taken by the individuals. Mr. Karnik’s book is not an autobiography or a biased report. It is objective and provides reasons for the actions taken on the various important issues. Part One of the book contains author’s perceptions of the various security issues. The opening chapter deals with the sudden Chinese attack in NEFA and Ladakh in October 1962. The first victims were the civilian IB personnel manning the observation posts. Mullik, Director IB, has been criticized for having exposed them to this risk. The IB undertook this task since the army had declined to occupy these forward posts. The army could not disobey a direction from the government. They could only advise and it was for the government to accept their advice or replace the army chief. The IB personnel had no protection and this forward policy provoked China. In case these forward posts had not been established, China would have occupied them without any opposition and it would have been difficult to dislodge them. The question remains whether a major Chinese attack was foreseen. Perhaps, occupation of the Dhola ridge was the immediate provocation. A salutary aftermath of the debacle was the reorganization of the Intelligence structure. Two separate organizations. IB and RAW were set up for internal and external intelligence respectively. The IB became essentially a Central Police organization. Rajiv Gandhi’s attempts to make it more broad -based failed. The Intelligence agencies are often blamed for serving the interests of the ruling political party by rigging elections and surveillance of opposition leaders to keep them in line. The author has categorically rejected these allegations. Intelligence is the shield of any state and becomes a weapon in times of war. At present there is no knowing of the achievements of IB and RAW but their failures are publicized. A committee of members of parliament of all political parties could be appointed to oversee their work. Such practice has been implemented in Western democratic countries. One of the difficulties in India is the tendency of political parties willing to compromise national security to gain points against the opposition. The Panchsheel Agreement has been described with the comment that "While serving the peace of the world, we sacrificed an unarmed neighbour [Tibet] and our vital interests.” Sardar Patel’s warning about the intentions of China was ignored. We should note that in negotiations with the other neighbouring countries, China has not conceded any territory from its claim line. They have taken the same position in negotiations with India. "The Chinese will always claim what is theirs and what is yours is also theirs. They are masters of making very important statements by not making any statements.” Mr Shyam Saran, former Foreign Secretary, has suggested that the Indo-China border, though not marked on map or on ground has not suffered any violence during the last several years and we should not worry about it. There have been a few cases of intrusion and pull-back. Lord Desai has commented that these acts by China are just to drive home the point that they can intrude and withdraw as they like. Military and economic strength along with correct political alliances are the only solution. India is facing terror acts in J&K by jihadi groups enrolled by Pakistan and by Maoists in the heartland. Knowing well that Pakistan cannot win against India militarily, it has resorted to a strategy of terror acts. It is wrong to presume that a democratic government in Pakistan would give up the policy of terror acts. There is need to strengthen the Intelligence network and frame appropriate laws to help the police in taking preventive and punitive action. The bogey of saffron terrorism has been raised by some politicians only to discredit the opposition. The massacre of a large number of CRPF personnel in April-May 2010 led to a demand for employing the Army against internal insurgency. The army needs laws like AFSPA and cannot fight own citizens as ruthlessly as they can against a foreign enemy. The need is to improve the training and operational capability of the police. The terrorists in J&K, North East and Maoists cleverly decided to exploit the Human Rights organizations to hit back at the security forces. The call by human rights activists and self-styled intellectuals to justify killing of police personnel is misplaced. It has almost become a religion for the Human Rights organizations to criticize the security forces without checking what kind of people they were defending. Not only the government but all the major political parties are hostile to these organizations. Arun Jaitley rightly pointed out that the over ground face of the underground is the real danger. State is not the ogre as painted by them and is a protector of the citizens. Intelligence community is blamed whenever the administrative authorities are caught unbalanced. Lack of military preparations and faults of the police are drowned in the talk of intelligence failure. Intelligence about some activities in Kargil was available in February 1999. It should have been investigated by sending patrols or other means. The lesson is that no part of the border should be left unguarded. The terror attack in Mumbai on 26/11 is a good example of how intelligence inputs were ignored. The operational authorities took the excuse that the intelligence was non-actionable. No intelligence should be ignored with such remarks. Instead, there should be an attempt to focus on what more information is required to take action. The book, Siege, co-authored by Adrian Levy claims that the US had given twenty six warnings about the Mumbai attack. The IB and RAW are unlikely to comment and the truth will remain unknown. The report by the Enquiry Commission comprising of Mr. Pradhan and Mr. Balachandran has pointed out the failures of the police but the media has generally ignored these parts of the Report. Mere assurances of corrective action are not adequate and effective steps must be taken to improve intelligence and punish those who support such acts. We must change our image of being a soft state. 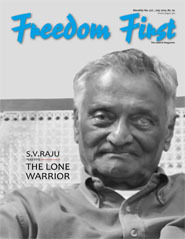 Part Two of the book comprises excerpts from articles published in the Freedom First on security, external dangers, corruption, governance and public affairs. The trial of Headley and sentence of thirty five years imprisonment by the US court angered India who thought it to be their right to try the person responsible for the Mumbai attack. The Indian courts would have taken a much longer time and perhaps pronounced a lighter punishment. It was good that he was tried in the USA. Afzal Guru was hanged in February 2013 after a delay of a few years. There has been criticism by organizations and some political leaders who want to ban death sentence. They forget that death sentence by the courts is awarded only in deserving cases. The country has paid a high price for the release of three dreaded terrorists in exchange of passengers on flight hijacked to Kandhar. A similar let down took place to get the daughter of Mufti Mohammad Sayeed released. The author has recommended that a resolution be passed in the parliament that the government would not give in to the demand of terrorists. The police arrested the terrorists responsible for the Delhi bombing. The HRD minister sanctioned legal aid to them in national interest and others demanded a judicial enquiry into the police raid on Batla House. Such acts can only demoralize the security services. The Arab Spring has caused instability in the Middle East and Africa. There is a danger of jihadi rhetoric raging there to spread to India also. Zawahiri has announced plans for a unit for jihad in India. The USA has suffered a few terror attacks like the Boston bombers and the shoe bomber. Few cases of corruption, espionage, denigration of institutions and poor governance have been given. The book is a must not only for members of the Intelligence community and students of history but also for the general public who are the main victims of terror acts and fault lines in governance.